...standing up for our rights as working people to a decent standard of living. ...supporting the right of all workers to organize and bargain collectively. ...fighting for secure family-wage jobs in the face of corporate attacks on working people and our communities. ...organizing the unorganized to take aggressive action to secure a better economic future for all of us. ...mobilizing those already organized to join the fight for jobs with justice. During the next year, I'LL BE THERE at least five times for someone else's fight, as well as my own. If enough of us are there, we'll all start winning. 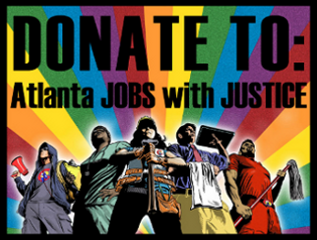 Atlanta Jobs with Justice (JwJ) formed as a chapter of the national Jobs with Justice in Dec, 2010, when a group of community groups, labor unions, and social justice activists met and determined that a strong labor-community coalition was needed in Atlanta, GA. Since formation, Atlanta Jobs with Justice has engaged in various campaigns and solidarity efforts designed to uplift working families and working class communities. Furthermore the coalition formed an Organizing Committee to represent its member organizations, established a complete online/social media/communications infrastructure, elected an Executive Board, hired a full-time Staff Organizer, took part in various trainings and regional strategy sessions, and became chartered as an official chapter of the national Jobs with Justice. Initially, Atlanta JwJ focused on unemployment and hosted a Speak Out for Jobs town hall event, where individuals were asked to speak about their experience with unemployment and then were offered a set of services and referrals to help them find jobs or cope with the consequences of unemployment. Furthermore, Atlanta JwJ hosted press conferences on the first Friday of the month in conjunction with the national jobs report to continue to highlight the struggles of unemployed individuals and their families. These efforts transitioned into the Justice for School Workers Campaign, when it was realized that all GA school workers unemployment benefits were being cut by the Georgia Labor Commissioner. During this campaign, the coalition was able to launch its Worker’s Rights Board and conducted a People’s Court event where the GA Labor Commissioner’s actions to cut unemployment benefits were scrutinized by community leaders with testimonials from School Workers from across the state. Currently, Atlanta JwJ is working to pressure the US Department of Labor (DOL) to sanction the GA DOL to pressure the GA Labor Commissioner to reconsider the denial of unemployment benefits to school workers. Since its inception, Atlanta JwJ has always worked to support the Immigrant Rights Movement primarily by acting as a supportive ally to leading immigrant rights organizations and attempting to build alliances between the immigrant rights and labor movements. These alliances were crucial in bolstering the effort to stop the GA State Legislature from passing HB 87, a bill copying the infamous Anti-Immigrant laws in Arizona. Furthermore, Atlanta JwJ has engaged in several worker/labor solidarity campaigns. After attending the Aug, 2011 Jobs with Justice National Conference, the coalition took up a campaign in solidarity with 45,000 striking Verizon workers in the Northeast. The Atlanta-based coalition held protests outside Verizon Wireless stores in the Atlanta Area in support of Verizon Workers who were struggling to renew a contract free from deep pay and benefit cuts. The Atlanta Coalition in working on the Verizon Campaign developed a relationship with CWA. From this relationship a campaign to prevent the layoffs of 740 AT&T employees in the Southeast ensued with support from Occupy Atlanta. The Verizon and AT&T campaigns concluded with a reduction in layoffs at AT&T and with Verizon workers receiving a fair contract free of the deep cuts desired by the Verizon Corporation. Atlanta Jobs with Justice has played a crucial role in defending working people and unions from right-wing attacks including GA State bill SB 469, that would have banned picketing, criminalized civil disobedience, and limited unions’ ability to organize and maintain their membership. Atlanta Jobs with Justice played an anchoring role in forming a coalition to defeat the bill, planning meetings and protests against the bill, and pressuring legislators to stop the bill. The bill was defeated on Mar 29, the last day in session for the GA State Legislature.